The river that supported his family’s town for generations will soon destroy it. “My grandchildren will not see where I grew up, where I lived. They will ask me, ‘Grandpa, where do you come from? Where did you live?’ What will I do? Show them the lake?” asks Ayhan, readjusting the scarf over his face. The small town of Hasankeyf, in Turkey’s Kurdish-majority southeast, inhabited for 12,000 years, is doomed to disappear in the coming months. An artificial lake, part of the Ilisu hydroelectric dam project, will swallow it up. The dam, which will be Turkey’s second largest, has been built further downstream the Tigris. Ilisu is a central element of the Southeastern Anatolia Project (GAP), a land development plan to boost the economy of the long-neglected region, through hydroelectric energy and irrigation. Confronted with the imminent flooding of their town and a hundred villages, the 3,000 habitants of Hasankeyf are divided. While some are angry at the sacrifice being imposed on them, others are impatient for the economic benefits promised by Ankara. Ayhan, who is retired, is steadfast in his opposition. He dedicates all his time and energy to fighting against the dam as part of the “Keep Hasankeyf Alive” collective, which brings together campaigning groups and locally elected representatives. Assyrians, Romans, Seljuks… the empires that washed over this region have left an exceptional heritage, not least the thousands of caves that were inhabited as recently as the 1970s and are a major tourist draw. “There is such history here,” says Ayhan. But the Turkish government dismisses the criticism, arguing that everything has been done to save the monuments. In one lengthy operation last August, the 1,600-tonne Artuklu Hamam bath house was loaded onto a wheeled platform and moved down a specially constructed road to its new home. Workers also recently moved the remnants of a 14th-century Ayyubid mosque, transporting it three kilometres to a site that will become a “cultural park”. 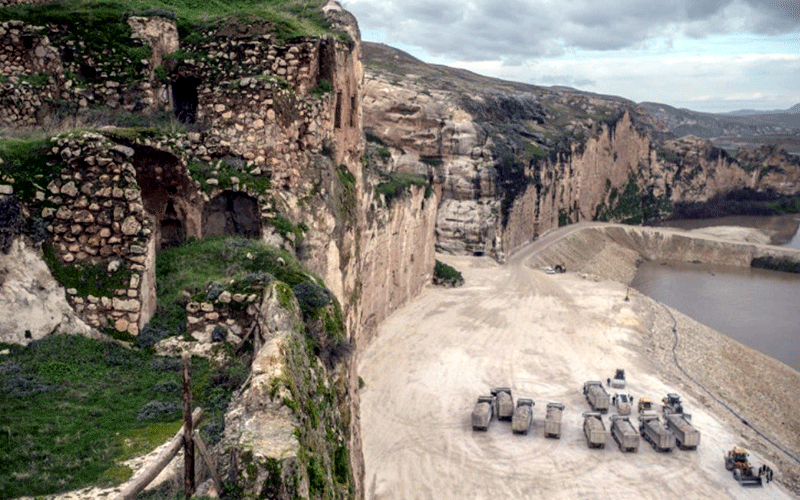 Such relocation operations have transformed Hasankeyf into a construction site. Busloads of tourists have been replaced by swarms of dump trucks and a crane that sits at the town’s entrance. In what is left of the old bazaar, the butcher, Zeki, sits among the morose-looking traders. “There are no more tourists,” he laments. “Who would like to come to see this? Every step you take you’re liable to fall into a hole in the ground,” he says. Former shepherd Ahmet Akdeniz prefers to look to the future. He presides over the Hasankeyf cultural association dedicated to promoting what the town has to offer and he cannot wait “to finally start (his) new life”. During the inauguration of the Ilisu construction site in 2006, President Recep Tayyip Erdogan, then prime minister, promised the dam would bring “the greatest benefit” to local people. Part of this promise involves building a “new Hasankeyf” on the other side of the river, with spacious flats and an ultra-modern hospital. But the construction work drags on. Currently it is a succession of small buildings separated by muddy roads, most of them unpaved. Akdeniz, originally scheduled to move in December, now thinks it will be summer at the earliest. “Look how we live today,” he says, pointing to the cracked walls of his 45-square-metre house. Heated by just a wood stove, he lives there with six family members. “All we want is to live with dignity,” he says. Akdeniz is also convinced that the dam will boost tourism, thanks to the renovation of the citadel and some caves escaping the rising waters. Engineers are still awaiting the green light from Erdogan to close a third floodgate and complete the retention of the water, a process launched last summer. After that, a three-month countdown will begin for Hasankeyf before it disappears beneath the Tigris. Contacted by AFP, the DSI organisation responsible for Turkey’s dams declined to give a planned date for completion. Turkish media report that it will be finished this year. But the project has already had a considerable impact on residents, says Suleyman Agalday, owner of a small, makeshift cafe. Delays and financial issues have plagued the dam’s construction — a project first conceived in the 1960s — “causing a lot of uncertainty in our life”, he says. In 1981, Hasankeyf was classified as a special conservation zone with a ban on construction that kept investors away. That lack of investment meant fewer jobs and many residents chose to move away for work or larger homes. A few weeks ago, Agalday went to the neighbouring province of Sanliurfa to see Halfeti village, submerged for 20 years because of a dam on the Euphrates. “There I saw what my future would look like and it hurt me,” he says.